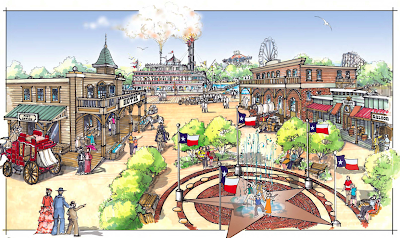 Grand Texas Theme Park has an Opening Date! It's Official, the Grand Texas Theme Park which has been dubbed by some as "The New Astroworld" will beginning opening in Summer of 2015. The Theme Park is set to open first but no announcements have been made yet as to which parts of the park will be open or if it will be opened in phases. However, an interesting rumor from another blog, The Montgomery County Police Reporter, has posted that the park plans to have one of the "Top 10 largest Wooden Roller Coasters in the Nation". As of this moment I can't find any details of the ride nor who may be building this mystery coaster. The same blog has posted that soil tests are fully underway right now and the heavy equipment will begin to arrive in January of 2014, giving the park a very short timeline to work with- only a year and a half. They also have a timeline of projected opening dates for the many projects which will be engulfed by the 630 acre site. We have contacted Grand Texas Theme Park to inquire about their media and news releases, more information as we have it!